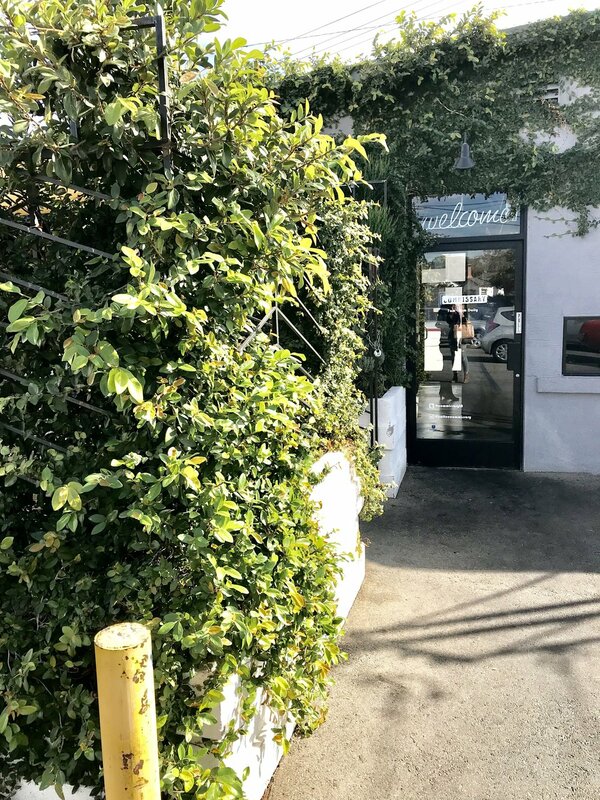 When I first moved to LA, I had the good fortune of finding an apartment that was directly located above one best coffee shops in the city, Coffee Commissary, in West Hollywood. Prior to this happening, I had always liked coffee – but finding an amazing artisanal gem like this one turned me into a true coffee aficionado. For three years, I got very spoiled. It was some of the best coffee I’d ever had, and it was only a few hundred steps from my front door. Then, I moved. Enter: my desperate search to recreate said coffee amazingness. So, I was beyond excited when Commissary agreed to an interview. 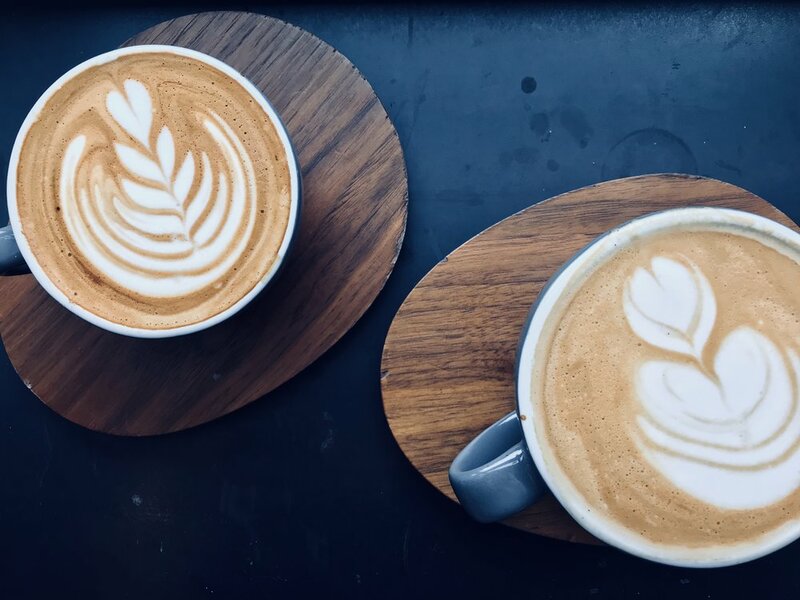 I knew I wanted to start an article series dedicated to finding out how to make the best coffee at home, because similar to being well versed in wine, or making a great cocktail, making excellent coffee is truly an art form. Pour overs, lattes, drip coffee, black coffee – whatever it is, I want to explore it! So read ahead for the first installment of “Secrets to Making the Best Cup of Coffee” – pour over edition, courtesy of Coffee Commisary in Los Angeles. Stepping through the doors of Commissary in Burbank, the first thing you’ll notice other than the delicious aroma of coffee, is the music. Then, you’ll probably notice the distressed orange and blue-painted chevron floor. Although its overall interior is distinctly industrial and eclectic -- with its architectural tables and chairs accented by minimalist light fixtures – it’s ambiance is decidedly warm and intimate. A large portrait of a rooster is painted on the wall (their logo), and a vine-covered patio out back welcomes coffee-drinkers into a surprisingly private caffeine-fueled escape. And like I said: the music. On the day I arrived, it was Muse. Their album played from beginning to end at a volume usually only reserved for bars after dark.
" 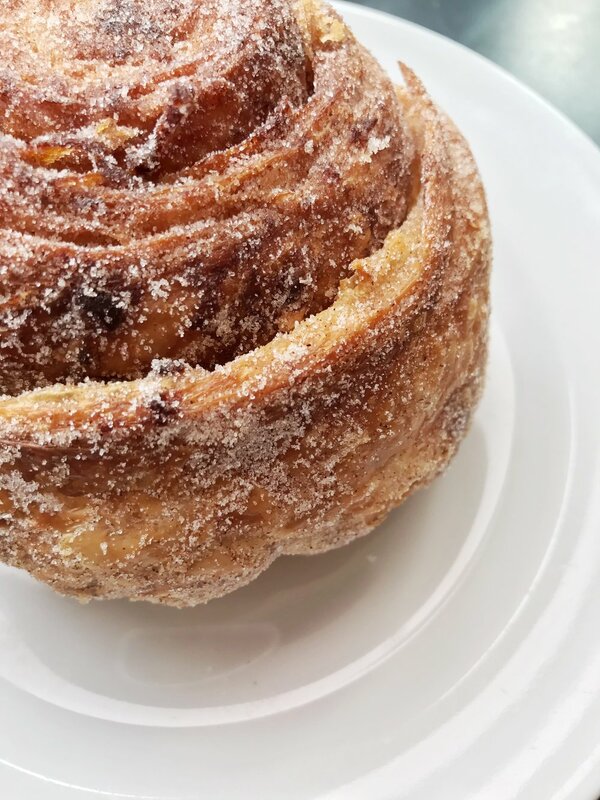 [A] favorite drink on the menu is the Cubano, which is a Saigon cinnamon simple syrup that we make in-house and we serve it as a cappuccino," says Eric Peters. And even still, the line was long and there weren’t but a few spare seats in the house. For a Los Angeles-based artisanal coffee shop, Commissary certainly bucks the mold of what you might assume is just another typical hipster hang out. 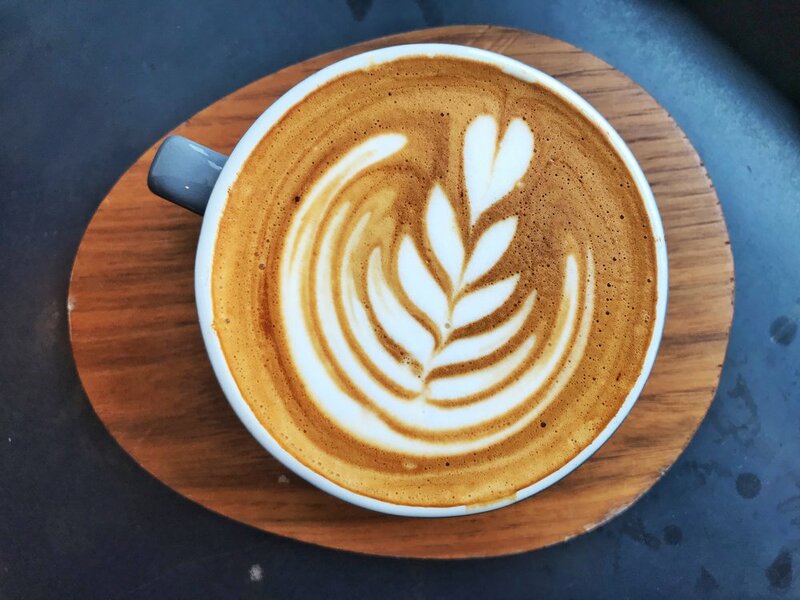 I met up with their Social Media Director and Regional Lead, Eric Peters, at their Burbank location to ask him about the Commissary experience, and to pick his brain about tips and techniques to creating the best cup of coffee at home. “If you think about it this way,” he explains, “the reason bars play loud music, is so that it creates privacy. Those people over there,” he said motioning to a table only a few feet from us, “probably can’t hear what we’re saying. We’re sitting right next to them and I have no idea what they’re saying. You know, [being in Burbank] people at this location don’t want other people to hear about their scripts, or hear about their movies. We have pretty high caliber writers that come here every day. For us, this is the experience we want to provide for our customers…it’s not a ‘work place’ or a ‘work zone’." Banana Bread Loaf from the Commissary bakery (front left) and the Cubano (back right). Peters says, "There’s no other coffee shop where you can get a dim sum rice bowl, banh mi & a fried chicken sandwich. We offer food that we think is really good, regardless of whether or not it fits into a typical coffee house vibe. We wanted to create a coffee shop that doesn't feel like a coffee shop." Peters is definitely right. 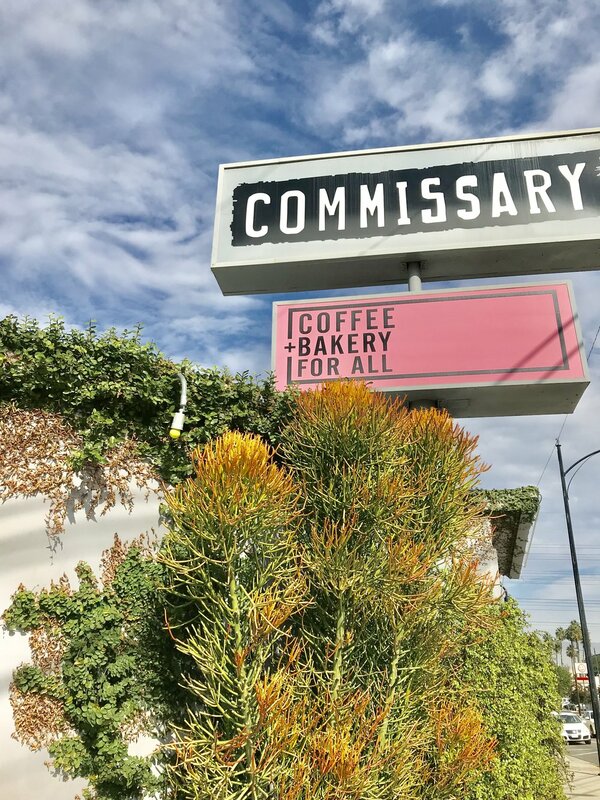 One of the things that struck me the most while spending part of the afternoon at Commissary was that it would be an excellent spot for a coffee date with friends or, actual dates. (You know, maybe the first-time meet up with Bumble match?) It takes on a bar-like atmosphere with the right amount of finesse that it feels comfortable – lived in, almost – without losing the integrity of what gets people in the door in the first place: really, really, great coffee. The headline on their website reads “In pursuit of the perfect cup.” So, naturally I asked Peters, What is the perfect cup? His answer? So immediately upon leaving Commissary, I hopped online in pursuit of my own perfect cup, and I purchased a pour over kit to experiment. There’s several different pieces of equipment that go into making a pour over, but upon further research, it does seem pretty straightforward once you get the hang of it. Continue reading below for a step-by-step guide to making the best pour over coffee. I lived on this avocado toast on the weekends from the food truck at the West Hollywood location. Unbelievably good! Top of the line machines help produce exceptional espresso drinks. Commissary estimates they make about 1,000 coffee drinks per day. Featuring the Hario V60 Series Pour Over Kit. 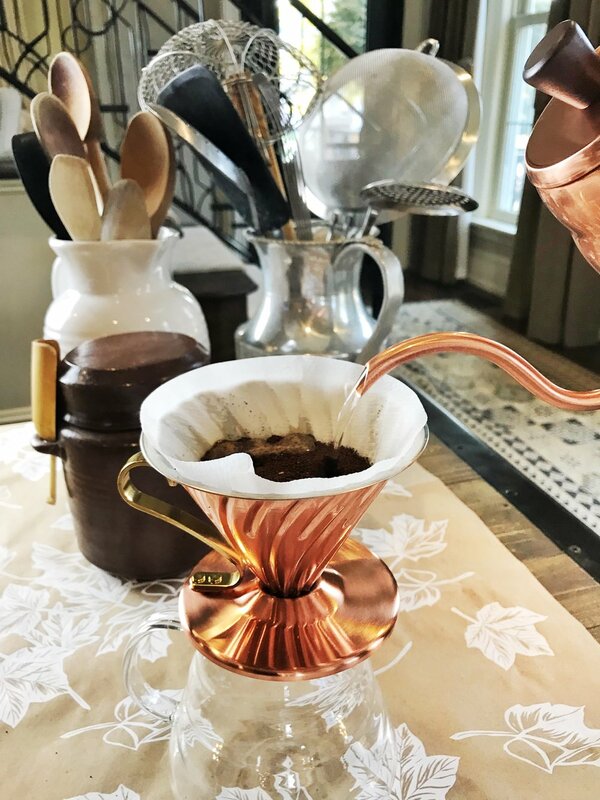 While Commissary spares no expense training their baristas, and sources only the best local ingredients possible for their food and coffee menus, you can still get close to recreating the perfect, Commissary-quality pour over at home. The biggest tip, Peters says, is to “start with really good coffee.” For example, the Los Angeles-based Take Flight. So, that is what I did. Place the filter inside of the copper series dripper. Put water in you kettle (or just into another glass if you'd like) and dampen the coffee filter. This prevents your pour over coffee from taking on a "paper taste" or a "woodsy" taste. Discard the water. Measure out 50 grams of water -- which roughly translates 1.76 oz. -- for each 12 oz. cup of coffee you would like to brew. Bring the 50 grams, or 1.76 oz. of water to a boil. For this recipe, I doubled it so I could make 2 cups (24 oz.) of coffee. 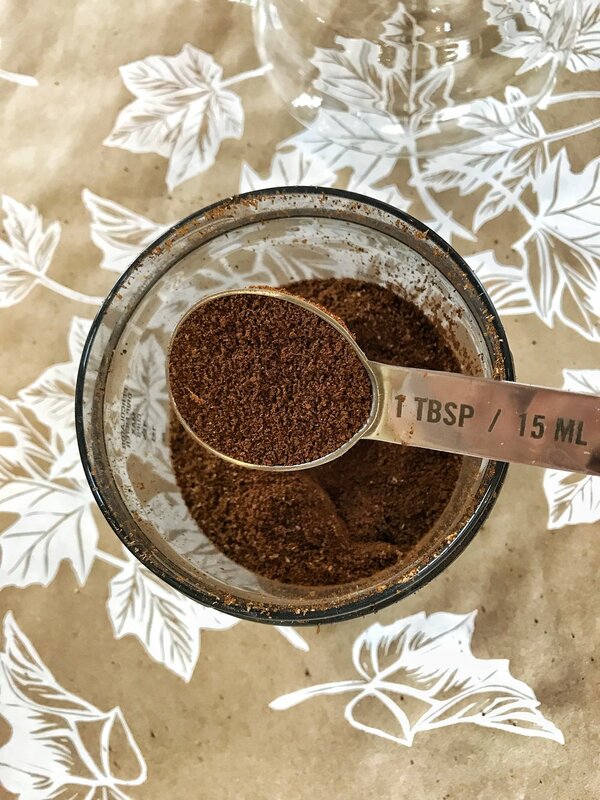 For the best pour over, grind your coffee beans to the consistency of sea salt -- between a medium to fine grind. It's also ideal to brew your coffee as quickly after you grind it as possible. The fresher the better! Place your measured out coffee into the filter. Even out the coffee so it's pretty level. Pour the water you had brought to a boil evenly over the coffee grounds. It should moisten (OMG sorry for the repetitive use of this word...eeee...) the coffee grounds, but shouldn't start to drip into the glass pot below. Allow the coffee to "bloom" -- a.k.a. allow the flavor in the coffee to develop, similar to aerating a bottle of wine -- for about 30 seconds. Bring an additional 12 oz. of water to a boil. It should be 12 oz. of water, for each 4 tbsp. of coffee you have bloomed in your filter. Once its boiling, use your kettle to pour over the bloomed coffee. Make sure the pour is steady so that it doesn't over-rush the coffee. Pour the water directly in the center at first, and then in a circular motion to finish it off. Once the brewing process is complete, stir the coffee in the carafe to blend the coffee.